Bharli bhendi chi bhaji recipe – This name may confuse you as it is in marathi language. If you translate it word by word, bharli=stuffed, bhendi=okra, bhaji=sabzi (dry vegetable preparation). 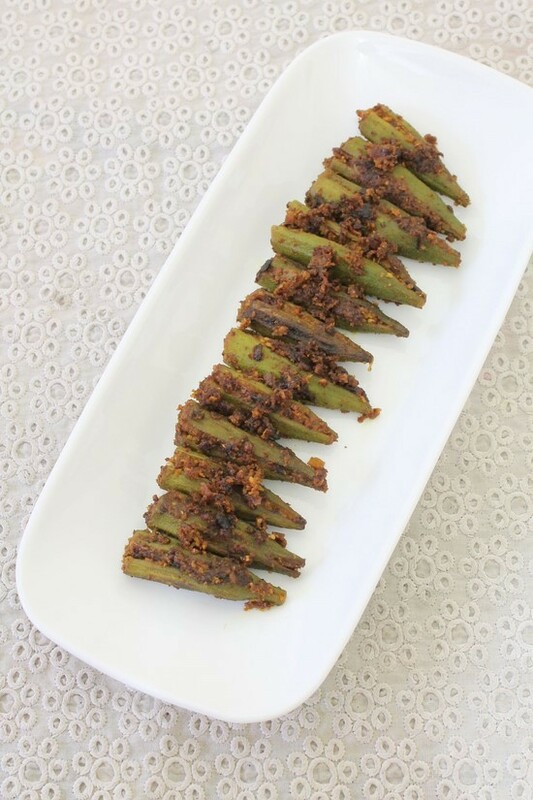 I have seen many online sources says that maharashtrian stuffed okra has peanut and coconut as a stuffing just like my Gujarati bharwan bhindi while this recipe uses only coconut with onion and goda masala. It is Maharashtrian style of making stuffed bhindi. I have adapted this recipe from a marathi cookbook. I am not sure this is traditional way of making it but I am sure that it tastes wonderfully delicious. Goda masala is must in this recipe. It gives very different flavor to the subzi. I have used homemade goda masala here but you can use store bought as well. But homemade has much better flavors. It is important to use little extra oil while cooking okra compare to other vegetable. As you know that everyone likes little crispy bhindi. No one likes soggy, at least not me and hubby. 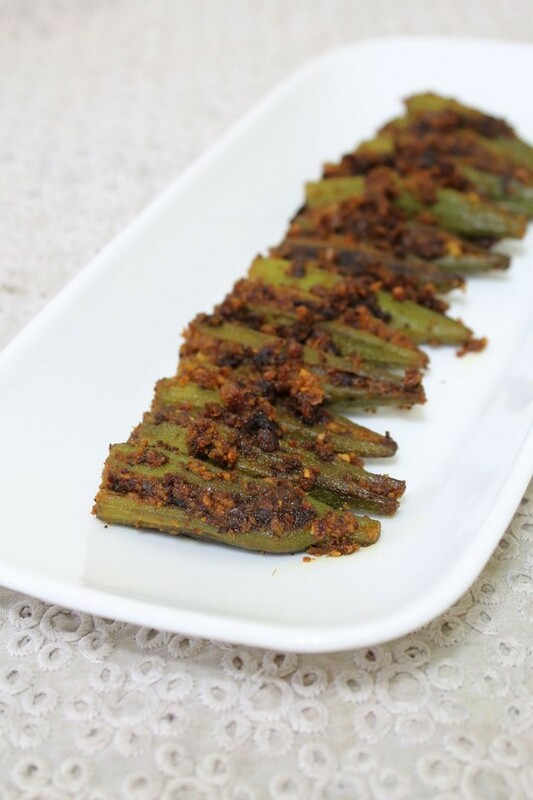 Make this bharwan bhindi in your kitchen and please let me know your thoughts in the comments below. Also I would like to know how you make bhindi at home. 1) Wash the okra or bhindi well. Wipe them dry with kitchen towel or paper towel very well. And let them dry till we make stuffing. This is important step to avoid becoming okra sticky while they are cooking. 2) Take coconut, cilantro, salt and sugar in a grinder and make paste out of it. If needed, add 1 tablespoon of water no more than this. 3) Add goda masala, onion and lemon juice to it. 5) Now cut off both the ends (head and tail part). Make a slit in the center, but careful do not break the bhindi to two pieces. Now using your one hand hold the bhindi and insert the thumb inside the slit, so it makes a gap in bhindi to fill the stuffing. And using your other hand fill that gap with stuffing mixture. You will have some extra stuffing, we will use that later. 6) Now heat the oil in a pan on medium heat. Add turmeric powder and red chili powder. Make sure that oil is not too hot, oil should be just warm so chili does not get burn and smoky. 7) Immediately add stuffed bhindi and toss very gently. 8) Add remaining stuffing mixture. 9) Mix well. If needed sprinkle some salt. remember we added salt in stuffing as well. 10) Cover the pan and let it cook. Do toss okra in between for even cooking and avoid sticking to the pan. 11) As okra cooks, they shrink and become darker in color. Once they are cooked and tender, turn off the stove. Serving suggestion: Serve with phulka roti or plain paratha. It can be served as a side with your dal-chawal. Wipe them dry with kitchen towel or paper towel very well. And let them dry till we make stuffing. Take coconut, cilantro, salt and sugar in a grinder and make paste out of it. If needed, add 1 tablespoon of water no more than this. Add goda masala, onion and lemon juice to it. Now cut off both the ends (head and tail part). Make a slit in the center and stuff all the okra with stuffing mixture. You will have little leftover, we will use that later. Now heat the oil in a pan on medium heat. Add turmeric powder and red chili powder. Make sure that oil is not too hot, oil should be just warm so chili does not get burnt and smoky. Immediately add stuffed bhindi and toss very gently. Cover the pan and let it cook. Do toss okra in between for even cooking. As okra cooks, they shrink and become darker in color. Once they are cooked and tender, turn off the stove. Hey kanan, thanks for sharing another great recipe. Am looking forward to the moong usal with goda masala. Love the simple everyday curries/ snacks you share. 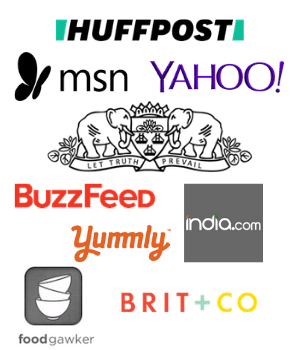 One more thing, lately your site has been behaving erratically. Recipes you post show up for a few days ( eggless mango cheesecake) and then disappear. Just wanted to bring this to your attention. Yea that is true. I am updating my old posts with new pics as old photos were with point and shoot camera. So when I update it appears on the front page. and as soon as I add new recipe old one went to its original month-date position. anyways thanks for letting me know. What a lovely blog you have here! I enjoy reading your recipes. One of my friends had given me this recipe for stuffing the okra. Make paste of garlic (lots of it), cilantro(with stalk) and green chillies. Add dhania jeera powder, turmeric, salt. Add aamchur powder if sour taste desired. The method for stuffing the okra and rest of the process is same as yours. Makes divine stuffed okra, but uses a lot of oil. So in an attempt to make this healthier without losing out on taste, I modified the recipe to make a stir fry instead of stuffed okra. So I make the stuffing (minus the salt), lightly sautee in medium hot oil until fragrant, then add the okra pieces (cut lengthwise into 4-6 pieces each) and stir fry in an uncovered pan until they cook and the stickiness goes away. Then add salt, stir fry some more, and serve! Tastes wonderful and uses less oil than stuffed okra! That sounds really delicious. yea it is true that stuffed okra needs lots of oil. I will try with your method some time soon. Thanks for sharing.